Concept Models Displayed at the Theme Zone of the Yamaha Booth at the Tokyo Boat Show - News Releases | Yamaha Motor Co., Ltd.
Kan-chan Remote navigational control by satellite. 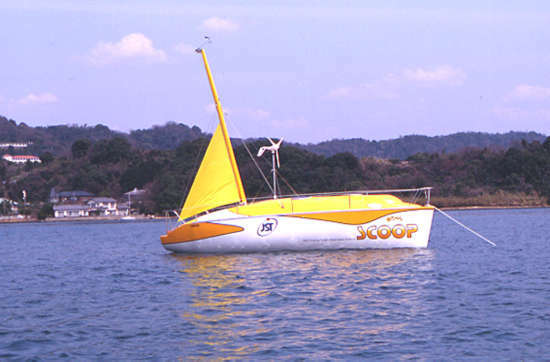 At the request of the Japan Science Foundation, Yamaha Motor designed and built this boat based on its Y-26S sailing cruiser. The boat will mainly be for use in gathering data on aerosols (colloidal particles) in the air over the oceans for use in research concerning global warming and weather pattern changes. Signals sent from a land station enable automated navigation to the desired destinations based on information from a GPS (Global Positioning System), after which the boat can stay within 50 m of the desired site and take atmospheric readings. The gathered data can then be sent on real time to the land station. The boat can run continuously at sea for a period of about one month. The boat is now the focus of considerable attention in the scientific community because it makes it possible to gather information while moving between a number of different observation points, which was impossible until now with the conventional observation buoy system. With most of the data gathering tests, offshore navigation tests and engine endurance testing completed, Kan-Chan is ready to begin actual observation duties in the seas around a base on Hachijojima island this spring.